Caveat Emptor: Every kid is different. In discussions with friends and family, it has become very apparent that what works well for one kid and one family does not work at all for another. My publishing of this list is in no way trying to influence the values, mores, habits, or style of your child's upbringing. People start bristling with rage pretty quickly if you try to do that. 1. The Happiest Baby On The Block. More than any other book we read, this one gave us the most confidence that, yes, we might actually have a chance at soothing a crying newborn. It's not perfect -- nothing is and we still had our share of late nights and early mornings -- but it sure helped. Also consider searching for videos of how to do some of the steps mentioned here on YouTube. 2. A Boppy. 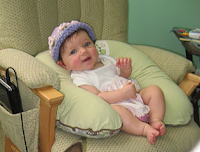 This horseshoe-shaped pillow has been instrumental in countless feedings, naps, and general soothing sessions. Other pillows could probably serve the purpose, but we have consistently reached for this one. Also useful for safely "stashing" the kid when you want to securely place her in one area. 3. Moby Wrap. This clever contraption is really just a 25 foot long, extra-wide scarf. But some fairly clever people (resourceful mothers, perhaps?) have found interesting ways to fold and wrap the thing around you so that it can securely hold your newborn, infant, and toddler in a variety of ways. This was very helpful for us for the first few months; it was great once you got her loaded up and you had both hands free to do other things. Babies usually sleep peacefully in this thing because they're all swaddled up and secure. Fair warning, though: they get hot, and I wouldn't want to wear this thing in the dead heat of summer. We have used ours a lot less since Beth turned about 4 months. En route to the Farmer's Market. 4. Baby Backpack. You can pay a lot of money for these, so I recommend asking for these as a gift. We inherited an old Kelty brand backpack from my sister, and have used it on many day hikes, walks to the Farmer's Market, and even while vacuuming. It's great to put the kid back there so your hands are free, and she often falls asleep. Two small warnings: it's slightly unnerving knowing you have your baby back there and you can't see her (is she falling over? can she still breathe? ), but after a few minutes you learn to trust the things. Also, she now has HER hands free, and can grab and pull your neck hair at will. 5. Baby Einstein Take-Along Tunes. We call this her "radio," and it's like crack. When nothing else will soothe her, the flashing light and upbeat classical music will usually lull her for 10 minutes of blissful peace and quiet. 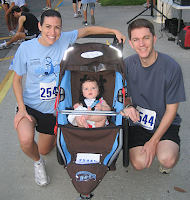 Before our first 5K with Beth. 6. A BOB Stroller. Okay, we splurged on this one. And even then, we bought last year's model on clearance sale from REI. (And looking at the prices of this year's model ... holy moly ... it's not worth $450. Look on Craigslist or eBay.) Initially, I thought I would never spend more than $100 on a stroller -- and to be honest, you probably don't need to. 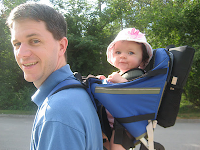 But a high quality, easily-foldable, great-to-run-with stroller has allowed my wife and I to maintain an active lifestyle by jogging with Beth (and the dog!) frequently. And the stroller is super maneuverable, and will easily navigate just about anywhere. We've even taken it with us on trail hikes, although that was probably a less-than-brilliant idea. 6. Interlocking Floor Mats. This was last weekend's project, where we converted a room into Beth's playroom, so the verdict isn't quite in yet, but it sure looks like fun. I wish I had a room like this when I was 6 months old. Sam's Club had a great deal on 0.56" thick, interlocking foam mats, and it was really easy to cut them to size to fit perfectly in the room. 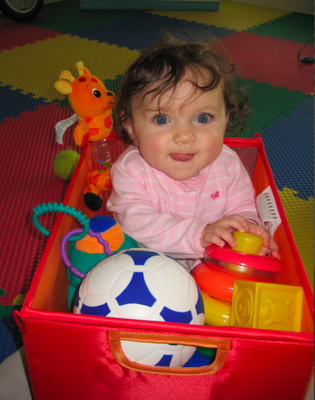 Now we can place her in the playroom and she can romp around all she wants. All in all, it can result in one cute kid. Beth, happily surrounded by toys.